Aaron Sheridan had hoped to die in the Rim War after his entire family died in the shuttle crash he was piloting. Instead, he wound up at Corinth Station, the command school for the Fleet. Though he was detached from the brutality and posturing of the students and instructors, he did make one friend. Standing up for that friend made Aaron a target, but learning that officer training isn't the Station's only purpose made it clear that he couldn't keep himself isolated any longer. A free book was provided for an honest review. 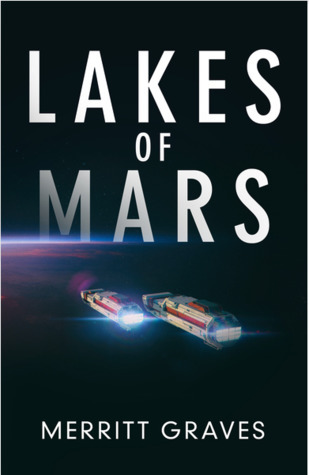 This is the first book in the Lakes of Mars series, and there is a Soundcloud soundtrack inspired by the book. It's a very haunting kind of listen, and fitting for a gritty, potentially violent hard scifi novel. The bullying isn't just some name calling; Aaron is marked to be killed when he defends Sebastian, and the fights he gets into are vicious and bloody. The treatment is tacitly approved by instructors, who make no move to stop it from happening, and have a more sinister kind of role early on in the novel. There is a lot of technical speak and little tidbits of information here and there, mixed in with the tragedy, paranoia and grandstanding. There's a lot of suspense from that aspect, as well as the tragedy of deaths among the students. Some of that pulls together about three quarters of the way through the novel, and then we discover why Mars is really all that important. Even with the knowledge of the real reason the Station exists, and the danger it poses to the Fleet, Aaron doesn't want to take action. It's the same hesitation that built up in the tension in the first two-thirds of the book, but here it feels almost annoying. I've gone through how much of this paranoia and technobabble, and then nothing is going to happen? When it finally does, it happens rapidly. That part is fascinating and suspenseful, with cinematic quality sequences. My biggest complaint about this entire novel is that it seems to take so long to get there, and then we end on a cliffhanger. A little tighter editing might minimize the dragging in some places early in the novel.